If you are looking for a unique wall decoration, you have come to the right place! Our room divider Facet looks stunning when used to decorate a wall. Whether you are in need of decorative wall panel design for your office or in your home, its striking pattern never ceases to amaze. A spectacular decorative wall panel design. Finding the perfect wall decoration isn’t easy. You can go for the standard option of a painting or a print. But you can also choose to go for something more spectacular. If you are thinking about the last option, then you should definitely consider Facet. It is not just a simple, plain screen that you attach to the wall and that is that. The individual parts of this decorative wall panel design can turn around. This gives you the freedom to be creative with the pattern. Go ahead and play with the shadows that it casts on the wall behind it. Facet is available in any possible size. Just give us the dimensions and we will make the perfect decorative wall panel to compliment your room. It is also available in a range of wonderful colors to fit perfectly in your interior. All colors make a beautiful combination with the brushed stainless steel ceiling attachments. Because Facet is made to order you can always send us your special requests and we will do our very best to fulfill your wishes. You also have the option to either attach it to the wall or to the ceiling. With the ceiling attachment, you can place it as close to or as far away from the wall as you want. With the wall attachment, the screen will be 23 cm away from the wall. As mentioned before, we are open to special requests and will gladly customize the ceiling attachments for you. We hope you feel just as inspired as we do by the beautiful Facet screen to also create your one-of-a-kind wall decoration. If you have any questions with regards to your decorative wall panel design needs, feel free to contact us. Our support team is here to help and enjoys coming up with creative solutions. 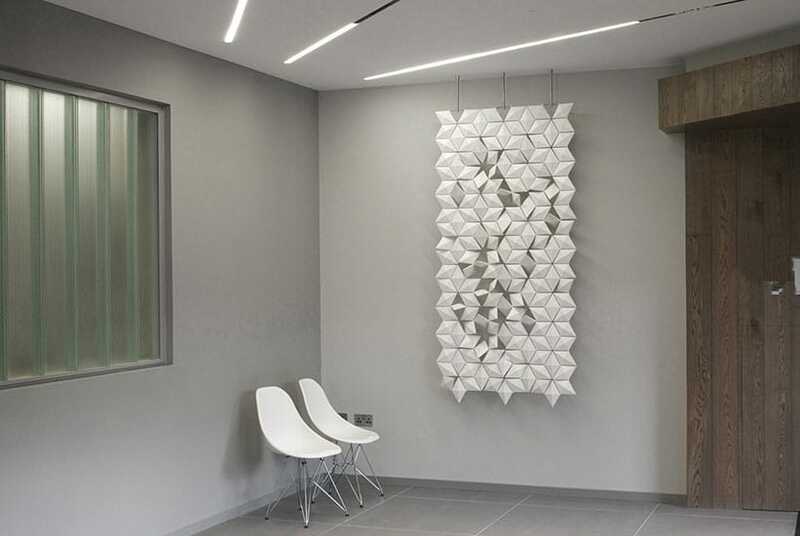 The decorative wall panel design screen seen in the photos, is installed in a modern design office in Belfast, United Kingdom. The white color brings more light into the office and looks very crisp in contrast to the gray wall behind it. Interior design done by Chroma Lighting.